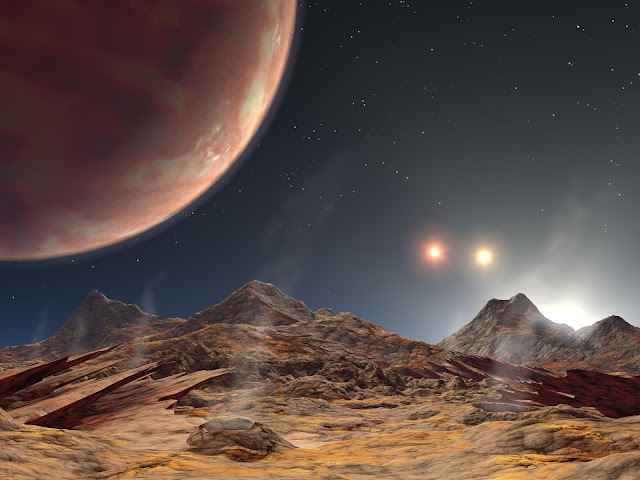 This artist's animation shows the view from a hypothetical moon in orbit around the first known planet to reside in a tight-knit triple-star system. The gas giant planet, discovered using the Keck I telescope atop Mauna Kea in Hawaii, zips around a single star that is orbited by a nearby pair of pirouetting stars. "The sky view from this planet would be spectacular, with an occasional triple sunset," said Dr. Maciej Konacki (MATCH-ee Konn-ATZ-kee) of the California Institute of Technology, Pasadena, Calif., who found the planet using the Keck I telescope atop Mauna Kea mountain in Hawaii. "Before now, we had no clues about whether planets could form in such gravitationally complex systems." The finding suggests that planets are more robust than previously believed. "This is good news for planets," said Dr. Shri Kulkarni, who oversees Konacki's research at Caltech. "Planets may live in all sorts of interesting neighborhoods that, until now, have gone largely unexplored." Kulkarni is the interdisciplinary scientist for NASA's planned SIM PlanetQuest mission, which will search for signs of Earth-like worlds. Systems with multiple stars are widespread throughout the universe, accounting for more than half of all stars. Our Sun's closest star, Alpha Centauri, is a member of a trio. "Multiple-star systems have not been popular planet-hunting grounds," said Konacki. "They are difficult to observe and were believed to be inhospitable to planets." The new planet belongs to a common class of extrasolar planets called "hot Jupiters," which are gas giants that zip closely around their parent stars. In this case, the planet whips every 3.3 days around a star that is circled every 25.7 years by a pirouetting pair of stars locked in a 156-day orbit. "In this close-knit system, there would be no room at the outskirts of the parent star system for a planet to grow," said Konacki. Konacki overcame this challenge using a modified version of the radial velocity, or "wobble," planet-hunting technique. In the traditional wobble method, a planet's presence is inferred by the gravitational tug, or wobble, it induces in its parent star. The strategy works well for single stars or far-apart binary and triple stars, but could not be applied to close-star systems because the stars' light blends together. Hot Jupiters are believed to form out of thick disks, or "doughnuts," of material that swirl around the outer fringes of young stars. The disk material clumps together to form a solid core, then pulls gas onto it. Eventually, the gas giant drifts inward. The discovery of a world under three suns contradicts this scenario. HD 188753 would have sported a truncated disk in its youth, due to the disruptive presence of its stellar companions. That leaves no room for HD 188753's planet to form, and raises a host of new questions.